This is a book exclusively devoted to three minerals: the Al2SiO5 polymorphs - andalusite, sillimanite, and kyanite. This may seem to be narrowly focused and esoteric. 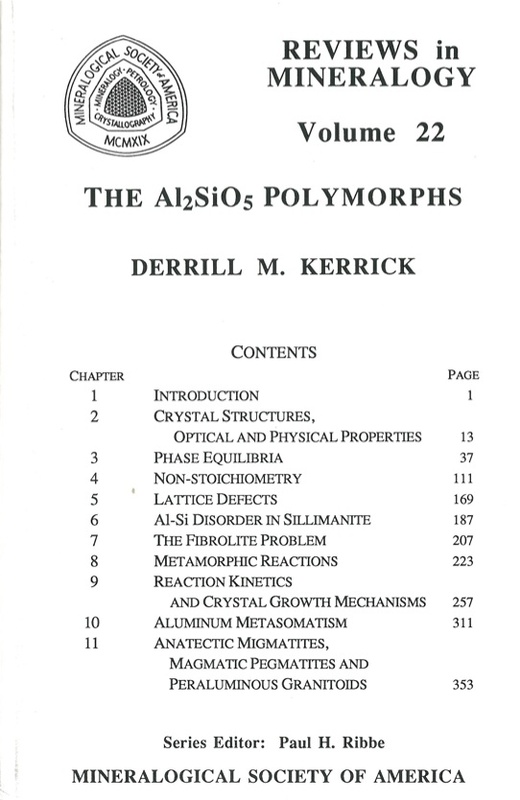 However, as discussed in Chapter 1, the aluminum silicate polymorphs are perhaps the most important mineral group to metamorphic petrologists. Because these minerals occur in anatectic migmatites and peraluminous granitoids, they are also important in igneous petrology. In spite of their geologic significance, there are a variety of experimental, theoretical, and field problems involving the aluminum silicates. Theoretical problems include the nature and energetics of lattice defects, order/disorder, crystalline (solid) solution, and interfacial energy. The aluminum silicates epitomize the importance of understanding the mechanisms and kinetics of heterogeneous metamorphic reactions. The difficulties in calibration of the pressure-temperature (P- T) phase equilibrium diagram illustrate the pitfalls of hydrothermal experimentation and the need to understand the methodology and uncertainties of calorimetric measurements of thermodynamic data of minerals. Thus, this book covers a wide variety of topics that must be considered in the analysis of metamorphic systems. In so doing, this volume illustrates the fact that modern metamorphic petrology demands an awareness of a wide spectrum of geologic variables and processes. In concert with the tenor of the Mineralogical Society of America Reviews in Mineralogy series, this volume is intended to provide a comprehensive review, summarizing the methods, theories and pitfalls of the various contributions on the aluminum silicates. Hopefully, this book will provide readers with a reasonably in-depth overview, and thus avoid the need for extensive, independent literature reviews. Although a concerted effort was made to give a balanced coverage of divergent theories regarding various problems involving the aluminum silicates, this critique nevertheless includes some of the author's biases. Several sections of this book present the chronological development of research on various topics, giving readers historical perspectives on the development of theories, models and biases on various problems regarding the aluminum silicates. As in all fields, several landmark studies have set the tone for the strategy of approach to problems. Although such studies have provided important steps forward in our understanding of natural phenomena, they have had the undesirable effect of entrenching biases and methodology. In this volume I have attempted to point out the deleterious effects of certain parochial approaches, an example being the aluminum immobility concept discussed in Chapter 10. In addition to their primary importance in metamorphic petrology, the aluminum silicates illustrate a wide variety of experimental, theoretical, and experimental problems. Because the Al2SiO5 polymorphs alone offer a pedagogic illustration of many important principles of modern metamorphic petrology.